KNOXVILLE, Tenn. (AP) — Grant Williams had 21 points and 11 rebounds as No. 6 Tennessee bounced back from its first loss of the season. ANN ARBOR, Mich. (AP) — Charles Matthews had 21 points and seven rebounds, and Zavier Simpson spearheaded another impressive defensive effort by Michigan, which rolled past North Carolina. Jordan Poole scored 15 of his 18 points in the second half for the Wolverines (7-0), who led 39-35 at halftime and then shut down the Tar Heels‘ fast-paced offense for a while. North Carolina (6-2) came in averaging 96.6 points per game, but Michigan was allowing half that at 48.3. The Tar Heels ended up a good deal closer to the lower number. Michigan outscored North Carolina 34-16 in the first 12:13 of the second half. At times, just getting a shot to the rim felt like an accomplishment for the Tar Heels. An alley-oop dunk by Jon Teske put the Wolverines up 49-39, causing North Carolina to take a timeout. Luke Maye had 11 points and 15 rebounds for North Carolina. AUBURN, Ala. (AP) — Anfernee McLemore and Bryce Brown each scored 19 points as Auburn rolled past Saint Peter’s. The Tigers (6-1) scored the game’s first 13 points and led by as many as 32 before halftime over the Peacocks (1-5), who have lost five straight. LEXINGTON, Ky. (AP) — Tyler Herro had 16 points, Keldon Johnson added 15 and Kentucky cruised past Monmouth for its sixth straight victory. TALLAHASSEE, Fla. (AP) — Trent Forrest forced a turnover with 16 seconds left and drove the lane to hit a pull-up jumper with 5.2 seconds remaining as Florida State rallied to beat Purdue. The basket was Forrest’s only one of the second half, but the defensie play was part of a critical sequence as the Seminoles (6-1) held on after Purdue led by eight points with 3:43 left. 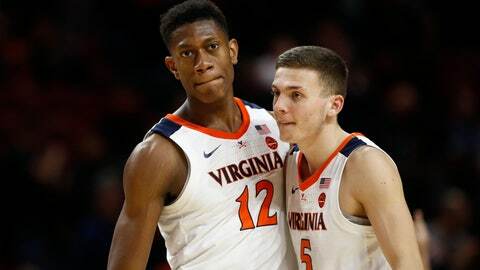 COLUMBUS, Ohio (AP) — Tyus Battle scored 20 points and Elijah Hughes added 18 to help Syracuse upset Ohio State in the ACC/Big Ten Challenge.